Never seemed fair to nail the "lazy" tag so permanently on the "Susans" but that probably has no "bearing" on the issue. 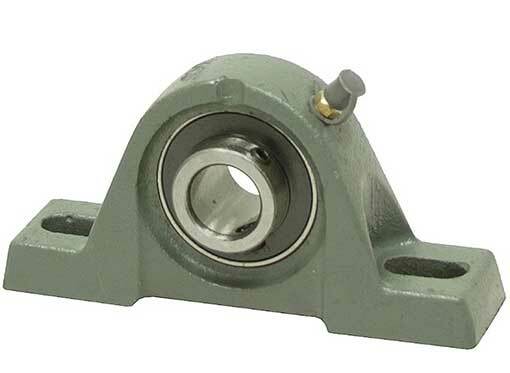 Also called turntable bearings, they are the square or circular flat ball bearing devices YOU bolt between two flat objects to achieve rotation. Like that spinning center section of a Chinese restaurant table. We had these in surplus once and they were quite popular. 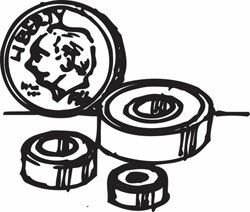 To our chagrin, we discovered they could be bought commercially for the same price. So we did. The 4" version is rated for a 300lb. load and the 12" (round) for 1000lbs. 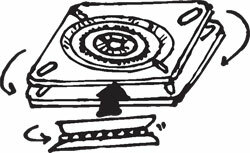 LAZY SUSAN TURNTABLE BEARING, 12"
Pardon us--just a little machinists’ joke. 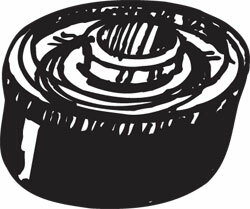 This sturdy cast-iron pillow block measures 5" x 2-3/8" tall x 1-3/8". 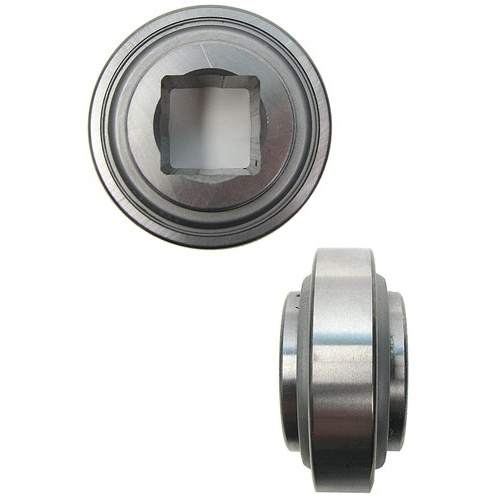 Has a sealed 1-3/4" dia bearing with a 3/4" ID x 1-7/32" bushing and a pair of set screws. Mounts via 7/16" x 13/16" x 1/2" slots in the base. Has a 1/4” lube fitting with a cover. Get a couple and add a 3/4” dia steel rod, and you’ve got the toughest towel bar in the universe. 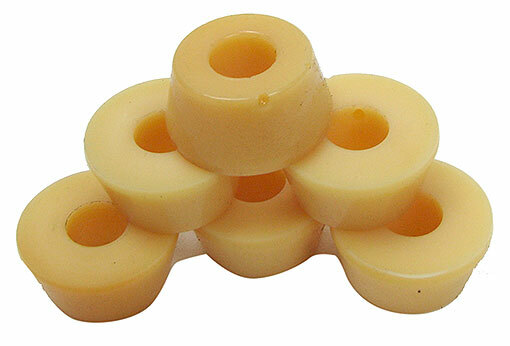 That's what these nylon bushings were made for, but they're suitable for anything that could use a little bushing. 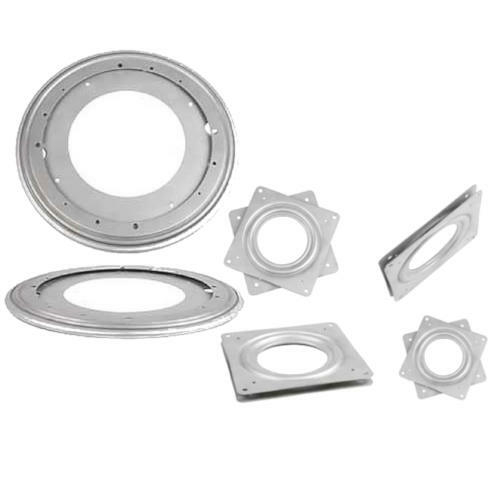 Our middle-sized measures 15/16" dia x 15/32" thick with a 3/8" bore and a slight taper. 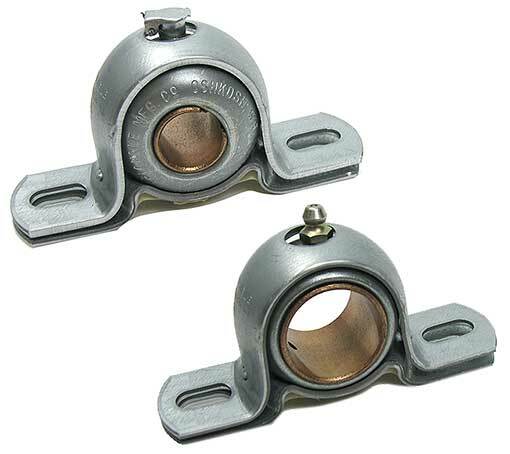 These pillow block bearings have 13-gauge steel mounting straps, 4" long x 1-1/8" with 5/16" x 5/8" mounting slots, and a sintered iron ball unit measuring 1-11/16" dia with either a 5/8” ID or 1” ID brass sleeve. 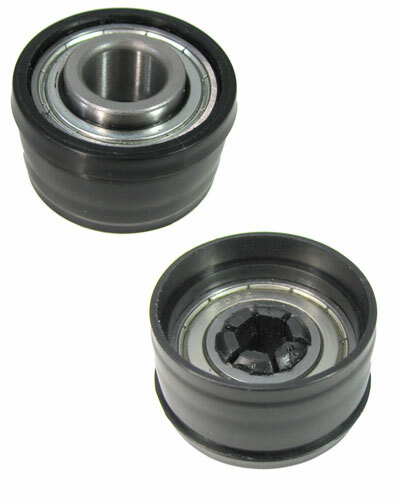 The 5/8” ID one has an oil cup on the top; the 1” dia version has a grease fitting in the same place. 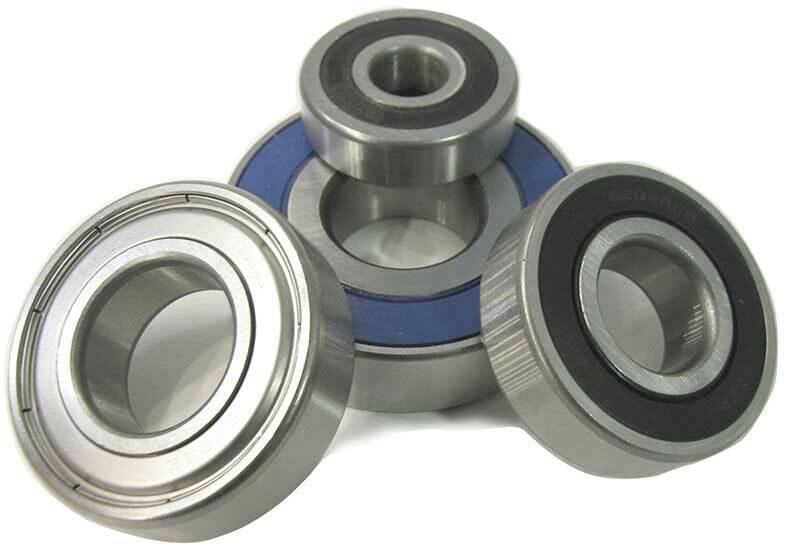 Bring these bearings to bear on your next project. Our supply and variety is constantly rolling over so get ‘em while we got ‘em!. Click on the bearing name to see a large photo of your favorite. 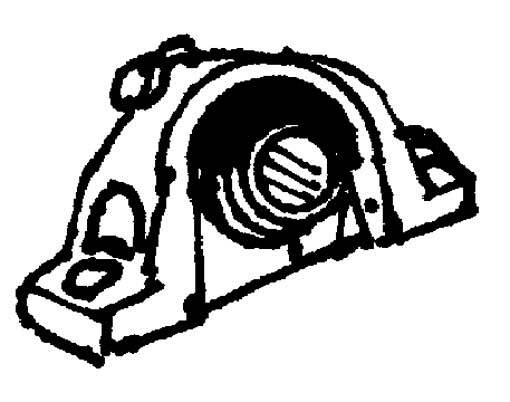 You pick: the sleeved bearing, sometimes listed as a "special agricultural bearing," is a single race radial bearing, 1-9/16" OD x 5/8" ID x 3/4" with a black plastic sleeve surrounding it, measuring 1-13/16" x 1" with a 1/16" wall; the booted bearing measures 1-1/2" OD x just shy of 11/16" ID x 1/2" thick, inside a 1-13/16" black rubber boot with a removable hex ID bushing. 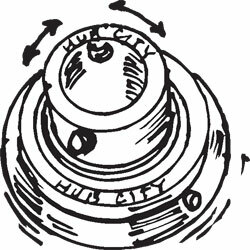 Interesting concentric sealed bearing, like a pillow block, from Hub City. 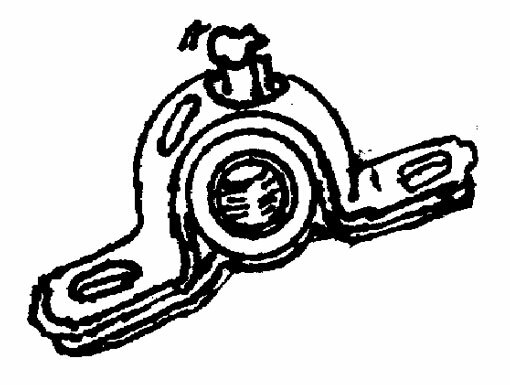 The outer portion measures 52mm dia x 15mm thick with an anti-rotation pin, and the inner measures 34mm dia x 12mm thick with a 22mm ID bore and (2) 3mm setscrews. Biggest industrial bearing we’ve seen in a dog’s age, and we’ve got some old industrial dogs around here. 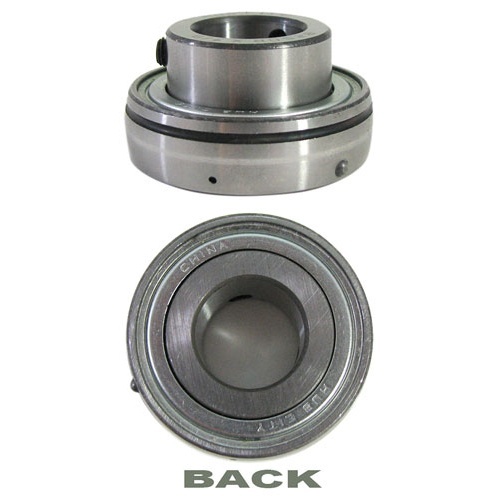 This shielded, single-direction roller thrust bearing is 80mm OD x 30mm ID x 36mm thick. Unique bore. Will fit either 30mm square or 31mm round shaft. Part #208PP5. You Enjoy A Nice Swivel? Well, who doesn’t, really? And yet most of us confine our swiveling to our local dive. 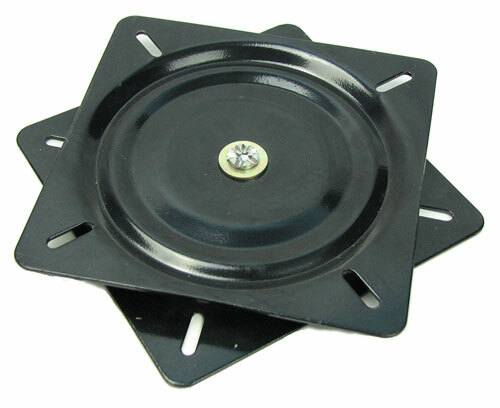 Until now, when you can buy genuine authentic bar-stool swivel plates and make home swiveling a reality. 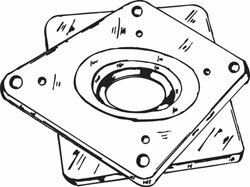 In heavy-duty steel, double 7” square plates are separated by a plethora of steel ball bearings, and have 1/4” mounting holes on the corners. 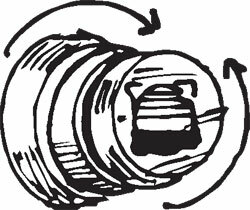 Might be a touch stiff at first, but a little break-in swiveling and a drop of oil or dab of grease will fix that. Please note: These are designed to be stiff not swivel freely. To test, add oil or grease, stand on and twist and shout like the Beatles.